Serb member of the BiH Presidency, Milorad Dodik, warned on Monday that general stalemate is evident in the country due to the failure to form the authorities at the level of BiH, that the sitaution in BiH is chaotic and that there are no prospects for it to be improved in a reasonable time. He told SRNA that Bosniaks are ready to risk BiH’s Euroupean path by their nitpicking and calling the formation of authorities into the question, which is undoubtedly one of the remaining measures which should have been taken after a meeting between the BiH Presidency members and the highest EU officials in Brussels who were very fair and flexible. “As the Chairman of the BiH Presidency, I must apologise to EU official for this,” Dodik said. He said that finally something must be changed in BiH, since there is no use of impersonating ikebanas in some institutions at the level of BiH, while a general stalemate in BiH is evident. “Subjects such as migration, economic reforms, and first of all the status of BiH in the EU have been called into the question by failing to form authorities at the level of BiH, particularly the Council of Ministers. This, of course, is part of a rotten political game by Bosniak politicians which they are playing by disabling the implementation of the election will of the Serb and Croatian peoples,” Dodik said. Also, Dodik says, it is visible that a Parliament has not been formed at the level of BiH. “The fact is that parliamentary commissions have not been formed since it is not enough only to appoint advisory boards and say that the houses of the Parliamentary Assembly are formed. The fact that the present ministers are at the same time deputies and the members of Parliament is absurd. We in BiH are now in an absurd situation which has lasted for too long,” Dodik said. He stressed that all this represents a general confusion which leads to BiH’s losing credibility. “The most recent example which supports this claim is that we do not have a delegation in the Parliamentary Assembly of the Council of Europe which BiH was obliged to appoint by April 6 having in mind internal dynamics of the Council of Europe which in April should verify credentials to elected representatives,” the Serb member of the BiH Presidency said. According to him, an additional problem is the fact that reforms in BiH are not implemented due to the failure to form authorities, reforms which would enhance prospects for dealing with the growing economic crisis which is obviously shaking many countries in Europe that are very important partners to BiH. He added that the migrant crisis is a problem that is hovering over BiH as one of the greatest problems in the country. “This problem also is becoming greater due to the failure to form authorities but also due to previous bad coordination between the Ministry of Human Rights and Refugees, the Ministry of Foreign Affairs and the Ministry of Security, lack of personnel and inability of the BiH Border Police to adequately fulfill their task to protect the border and prevent a great number of migrants from entering the country. This speaks that coordination with other police agencies in BiH is very poor. All this makes BiH very vulnerable,” Dodik said. He said that the latest data show that that 4,000 illegal migrants, accommodated in six reception centres, have been registered in BiH, and that 1,045 new migrants were registered by the end of February, which is significantly more than last year. According to him, in 2018 more than 24,000 migrants were registered, while the number of those who were not registered is not known. “We today see that many of them are conducting violence in BiH, attacking people in the streets, seizing money and phones from them…” said Dodik, stressing that the structure of migrants, at least those registered, is interesting. He said that one of the greatest dangers Republika Srpska is facing is the stationing of a greater number of migrants in its territory and that the Republika Srpska Government must train the police and redirect police forces to protect migrant entry points. He stressed that BiH remains a permanently divided society and that when it comes to Republika Srpska it is no good for anything. “Srpska suffers a serious damage due to the failure to form authorities at the level of BiH, primarily because Bosniaks wherever they can, are devastating or are trying to devastate the Serb people and their will. This is seen in the fact that they are preventing genuine political reprsentaives from doing what was stipulated by the Constitution. We are elected by the Serb people and we only ask to make available what belongs to the Serb people based on legal and legitimate elections. We do not beg anyone. 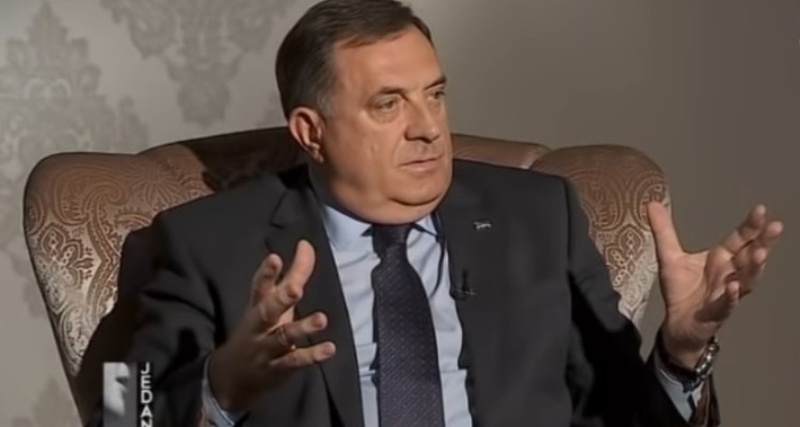 Procrastination and Bosniaks who every day invent something new in order to halt the process certainly do not contribute to building trust of Serbs and Srpska in BiH,” Dodik said. Dodik said he welcomed foreigners’ not interfering in the formation of authorities at the level of BiH, since as soon as they distance themselves from the process, it will be obvious that BiH does not have the capacity for life. He pointed out that Serbs and Croats having capacity to form a government in December is not enough, if there is a political turmoil within the third party in Sarajevo, which is constantly trying to keep the status quo with terrestrial games, i.e. to abuse institutions – from intelligence service to other bodies exclusively working in favour of Bosniaks, ruining others. Speaking about the Draft Law on Public Order, Dodik said that security is to be strengthened, which is one of the promises made in the pre-election campaign that will certainly be done. “Let all who criticize this go to the USA and see how it works. The US Police are authorized to shoot and kill, if they suspect that someone is ready to resist. Then, they talk about some rights and freedoms. Before the war, we did not lock the doors to the houses and apartments, while the tales were told about padlocks on the doors to the houses the USA-wide in order to protect themselves from the burglars. Nowadays, unfortunately, it is our time to do the same. There are more and more rebellious groups looting and bringing instability to the people,” Dodik said. He stated that authorizing the police in terms of reaction is a rigorous approach to this. “Of course, the abuse by police officers needs to be combated. This is not the dominant issue today, but the fact that police officers are exposed as clay pigeons in different locations, and their every act is closely monitored regardless of criminals on the other side” said Dodik. Dodik emphasized that he fully agrees on the freedom of journalism, but as politicians’ freedom is limited with the freedoms of other people, the freedom of journalist is also restricted by the rights and freedoms of other people. He pointed out that Europe has entered the adoption of a series of measures enabling the increase of accountability for publishing false news in the social networks system, so why this is suddenly a problem here. “In the USA, when one defames someone in the media, and that someone sues, he/she can get a few million reimbursements for defamation. In our country, this is narrowed to as much gossip as possible, to ruining the family, with a number of journalists using either quasi or accurate assessments about someone, publishing it without any accountability, using social networks, and thus avoiding liability. Unfortunately, there are fewer professional journalists who respect their profession and ethics,” Dodik said. He said that he is ready to talk with everyone, to provide every journalist with full freedom so if one works as a reporter he is to publish and announce news, but if the one is analyst he and the media are to bear responsibility for what he/she said, as this way contributes to security. “It is about creating distrust in the system, in the state, in Republika Srpska. Therefore, we require absolute freedom here. You cannot expect someone from Western countries to come here and explain to me how absolute freedom should be given, while they are passing a law on preventing the spread of false information through social networks. Well, we will only copy it from them,” Dodik said. He asked why this can be allowed here, but is not allowed in the Western countries. “Let’s copy police rights from the USA, I ask nothing else. Why cannot we do it? Or, we will only copy criminal penalties for defamation, so you will see then how it looks like when one publishes false information about someone and get few million dollars penelty. We have to introduce the order. Regardless of the fact that the quasi-organisations, paid by Soros and others, tried to make a fuss, this thing will go on and be even more rigid,” Dodik said. Next articlePupovac: First Serb might become member of European parliament soon?